Do you have a smile that isn’t everything you would like it to be? Are you avoiding going to your sister’s wedding or your daughter’s graduation because there is a chance they will want you to have your picture taken? Has having a less than beautiful smile affected your social life or your oral health? One fantastic answer has been restorative dentistry, let our caring restorative dentist help you. Restorative dentistry, in a general sense, is any dental procedure that restores your smile and makes it lovely, healthy, and functional. Our restorative dentist can bring back your original smile or create the smile you’ve always wanted. Let our well-trained team in Lodi serving the Stockton and Galt areas, get you on the path of a great smile to meet with a restorative dentist today! What Are Some Restorative Dentistry Procedures? Dental Crowns — Dental crowns are a tooth-colored cap that is placed over your original tooth. They are made from strong, durable material and can look, feel and function just like a natural tooth. When you laugh or smile or eat, no one would ever guess they are not your original teeth — including you! 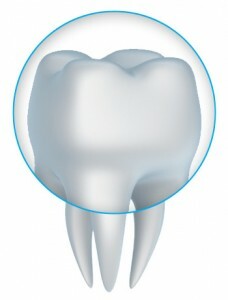 Dental crowns can also be used if you need to have a missing tooth or teeth replaced. The restorative dentist takes the dental crown and places it on dental implants, and then a bridge or denture can be placed on the gap where the missing teeth are. Dental crowns require no special care — just brush and floss as you usually do and see your dentist regularly. And as an added bonus they will never get a cavity! Dental Bridges — If you have a lost tooth or several missing teeth in a row, an excellent restorative dentistry procedure is having dental bridges placed. Dental bridges are secured with dental crowns on each side of the dental bridge. The restorative dentist take the dental crowns and place them over your existing teeth or they are placed on top of dental implants. Dental bridges can either be removable (something like a retainer) or secured permanently. If you think restorative dentistry dental crowns or dental bridges are what you would like to have, call our experienced restorative dentistry doctors today or visit our office near Galt and Stockton in Lodi!